Welcome to a world of beauty and magic. 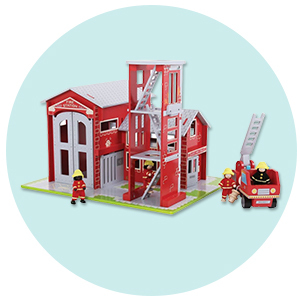 Create enchanting worlds full of beautifully hand crafted animals and figures, all unpretentiously designed to delight and inspire children while letting their imaginations take control. Ostheimer's beautiful range of handcrafted toys includes animals from all corners of the earth, fabulous figures for fairy tale adventures, and a great range of buildings and accessories including a fantastic ark that can be turned into a pirate ship and a fabulous collection of castle components that can be used to create the most fabulous dwellings and battlements for knights and princesses. There's even a dragons cave an incredible fire-breathing dragon. Ostheimer uses several different kinds of wood, favouring maple for the figures as it has less grain which allows for finer detail. Alder is used for the castle pieces which has a lovely grain to it and looks absolutely fabulous. While sometimes they will choose Ash for animals such as the boar that require a rougher texture. It's this level of thought and detail that really make Ostheimer toys so very special. Treat your child to a witch and Cat for Halloween, a wishing well for fairies, a cannon and cannon balls for protecting the pirate's treasure. Each one of their toys is something that will last a lifetime and you'll certainly be wanting to pack them away for the grandchildren once your own stop playing with them. Or just keep them as ornaments. And there's no reason you can't buy these for adults too. The animals make perfect gifts for all ages and are loved by everyone young and old. Ostheimer animals are beautiful handcrafted wooden figures and the toys are of the highest quality. Ostheimer animals are made in Germany and often employ less abled adults to make these, with each person needing 12 months training before they complete their apprenticeship. These natural wood figures are in the Waldorf style which allows children to use their imagination to play with them, in their own little world. The wooden figures have been handmade, hand-painted with non-toxic dyes and will last a generation. There are so many stunning animals and figures that it can be hard to know where to start. We recommend you just choose your favourite (or your child's favourite) and go from there. Build your Ostheimer collection or mix and match with Holztiger. Another beautiful brand of handcrafted wooden animals that sit wonderfully side by side. Ostheimer at Baba Me is a really big deal for us! 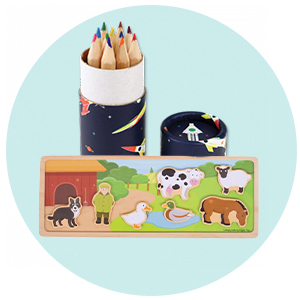 We love their wooden toys, the details they put into them, the history and ethics of the company, how wholesome the toys are and how well they fit in with our ranges of lovely products here at Baba Me. How this company started up has always fascinated me so I want to share the story here with you now. The founders of Ostheimer Wooden Toys, Walter & Adeline Ostheimer, met when they both worked at a Waldorf toy factory in Germany in 1926. They worked there together. They made their own first toys together in 1939 but in 1950 they have a hard time competing with mass-produced plastic toys and their toy making business was put on hold. In 1958 they started making toys again, this time working alongside a group of people with physical and mental disabilities in workshops. They made some simple moveable scenes and jumping jacks out of plywood! In 1959 the Ostheimer's eldest daughter Margaret was working as a Waldorf teacher. She sat down with her father and together they designed a whole range of toys in the Ostheimer style that we love today. Sadly in 1965, Walter became seriously ill and he passed away. 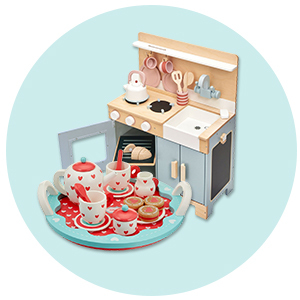 In 1967 Margaret and her mother Adeline moved their little wooden toy workshop from an apartment to a garage. During the 1970s in Germany, suddenly wooden toys became in vogue again and everyone wanted to have beautiful ethical toys for their children to play with. I think this is where we are the last few years in Ireland and the UK. Moving again to quality, and not quantity. By 1990 the company had expanded its workshops and new buildings had to be built to house the packing room and hold stock. In 2000 a shop was added to the workshop buildings where members of the public can go and look at the toys and buy them in person. This shop is still there today if any Baba Me parents want to take a trip! In 2011 the company changed from a private company to a foundation so they could support local projects an initiatives, and not just focus on profits. Ostheimer is a company that is certified as having exceptional work safety with the Mutual Indemnity Association. To me and you that means that Ostheimer is the first wooden toy company in Germany to ever receive such an award, and that is a big deal. That's quite a history, isn't it? They really did come from humble beginnings. Fast forward to today and Ostheimer now employ 35 women and men. 5 of those positions are held always for people with disabilities. 100 women and men work from home for Ostheimer finishing the wooden figures & animals. The toys are still manufactured in the original factory and some of the ranges are now also produced in 5 workshops in Poland. 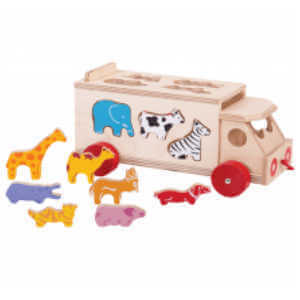 Ostheimer wooden toys are known around the world for being a top quality, Waldorf style toy brand and we are so proud to have these gorgeous pieces on the shelves at our shop in Ireland, Baba Me. Ostheimer believes that children are inspired to embrace the world with all their senses and to thrive in wholesome, open creative play. Children need this play for a healthy childhood! Ostheimer wooden figures and animals give children a beautiful and pleasant image of the world. Their toys symbolise the good in the world, they let children see that the world is good and they allow for beautiful unscripted open-ended play. 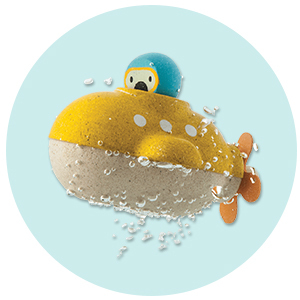 All Ostheimer Wooden Toys are made with environmentally-friendly materials. All the alder wood that is used for the toys is sustainable domestic forestry. They use a small amount of muted paint and organic oil to preserve all the wonderful natural qualities of the wood and every single toy is then hand stamped with the Ostheimer logo. All of their toys have a wonderful human presence and feel wonderful, almost therapeutic in your hands. Every single shape is designed by hand drawn, cut or sawed out, sanded, rubbed down, oiled and then painted, then stamped with the Ostheimer seal of approval. Think of all the hands that have many each and every figure and all the workmanship that has gone into them. I know a lot of our Baba Me customers might look at these wooden toys and be thinking Why so expensive? Well, all these steps and this labour intensive process to create each and every single animal and figure is the reason why! These toys are heirloom toys, they will be handed down to grandchildren, lifted down from the attic in a dust-covered storage box all ready for the next generation to love. 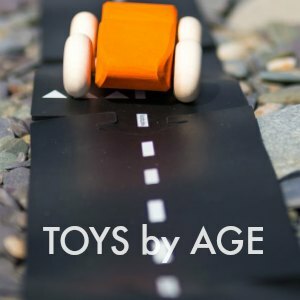 With a history dating back to 1926, they are one of the best-known brands for producing beautiful, unique and handmade wooden toys in the world today. The figures by Ostheimer are amazing and make for an amazing fantasy world imagination. As you all know at Baba Me we put a lot of thought into the brands we stock. We want to know how the toys are made, who makes them, the materials that are used and where the materials come from. Ostheimer has ticked all the boxes with us for a long time and now as we expand our ranges in Jan 2017, I felt it was the perfect time for them to join Baba Me. The figures are handcrafted in Germany and Poland, and directly employing more than 35 men and women, and indirectly employing over a 100 more, they have won awards for the wonderful way they look after their staff. It has become well known as a Waldorf inspired toy brand. We can thank the founders Walter & Adeline for the direction they went with their toys, their daughter Margaret who herself was a Waldorf teacher also played a large part in designing with her father the figures and animals as we know them today. Ostheimer Range - It's big! The wooden animals and figures range is huge. There are over 400 products in total and Baba Me will be stocking the entire collection. I’m not sure which pieces are my favourite yet. I think I like a few pieces out of every range! The Wooden Castles are AMAZING. 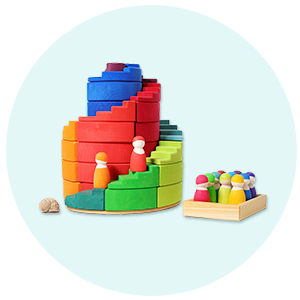 You can start off with a simple set of castle building blocks. At your little one’s next birthday you can add in an Ostheimer Wooden Jailhouse, Wooden Drawbridge or a Dragon Cave. Figures and animals can be bought every now and again to slowly build your collection into the perfect set to suit each child. Every single hand-crafted piece is designed to be enjoyed alone or built on to make your perfect custom set. The Ostheimer Wooden Ark is a huge piece. It’s big enough for kids to sit in! There is no need to fill it with conventional animals like the story we’ve all heard of with Noah. How about a Wooden Monkey Family, some colourful Wooden Parrots, a family of playful Racoons, a Unicorn, the Pied Piper, a King and a Wooden Moose! I adore the way the Ark comes empty, ready for you to fill up bit by bit as your children and family grow. 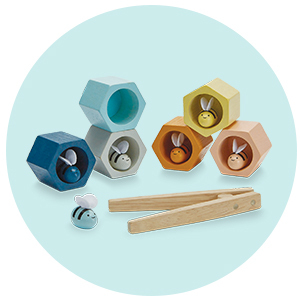 Ostheimer Wooden Toys makes great stocking fillers, alternatives to Easter Eggs, gifts from the Tooth Fairy. You could always spoil your little one and get them a whole set of animals for their Birthday or Christmas like a themed Woodland Set of animals, the Arctic Animals and marine creatures or African Animals with some figures on safari! It really is a heirloom piece that can be passed on for generations, so know when you are investing in it, you have a piece that will last! We love open-ended toys at Baba Me. 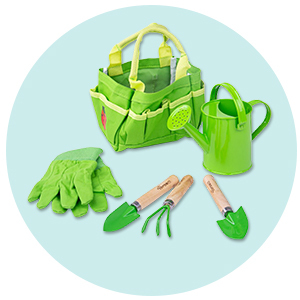 Their simple design and colours encourage children to make their own stories up and create their own Fairy Tale lands filled with adventures. As adults, we don’t need to constantly intervene in their play. Their job is to play! Their lives, thoughts and emotions are all played out in the world around them. If they are surrounded by beautiful wholesome pieces then they will become the main point of their lives. Keep things simple for your kids ’â€œ their imaginations will surprise you. Crafted by hand from start to finish, they are finished with non-toxic paints and stains and they are all finished with Organic Oils. Every single piece has been made with love and has passed many human hands on its way to you. Every single figure, animal and building is unique and receives their logo stamped on the bottom when it is completed. Each piece is chunky, fat to hold, warm to touch. The curves of the figures and animals are addictive. When I first feltone, I became almost trance-like as I ran this beautifully carved piece over and over in my hands. It was so smooth to touch. It smelt wonderful, I breathed it in deeply knowing the wood came from sustainable forests. Every piece is a full sensory experience. To be honest I am dreading letting the packing staff handle it for orders as I know every single piece will be stared at and discussed among them as they enjoy the wonder of these pieces. That might sound romantic for a group of grown-ups, but I don’t want my staff to slow down packing your orders! Are you within driving distance of our wonderful shop? The Baba Me shop is located just off the motorway between Jonesborough in Newry and Dundalk in County Louth. We are right between the North and South of Ireland. They really are special and they really are worth the money. These toys will be around for your grandchildren to play with. I invite you to come to our shop and see them if you can, I promise you’ll fall in love with them immediately. If you have a child with Autism Spectrum Disorder please let us know on arrival as we have special procedures in place to make your visit more comfortable such as dimming the lights, turning off all music and making sure no warehouse staff are picking in the shop for the duration of your visit. This wooden animals collection has a magically diverse range of figures and people. Every single face has been hand carved, sanded and painted by different people. If you look at the people you will see all the simple details put into every single character. 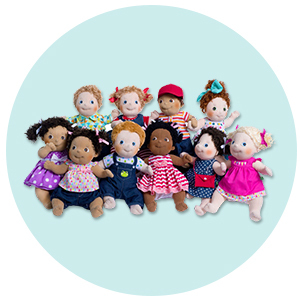 These figures are ready for your little person to bring alive! Personally, I love the Robin Hood character, the King with his lovely crown and the children. Pictured here is the Ostheimer Mother, an Ostheimer Child, the Ostheimer Court Jester and the Ostheimer Crown Prince. Never mind a collection for your kids to play with, if you are like me you’ll end up having a whole Ostheimer Wooden Toy collection for yourself. Where to start with Ostheimer Animals? We get asked this a lot! With such a huge range of gorgeous wooden figures, it can be hard to know where to start with your collection. I always say, just start with the animals you love! For me, that would be the unicorn, dragon and dragons castle. But for a younger child, a farm collection may be better. What age are Ostheimer figures suitable from? Most of the wooden figures and animals are classified from age 3 onwards, however, under close supervision and with larger animals they can be used from a younger age. Are Ostheimer figures suitable for a nursery? Absolutely, we could not think of a better place for them! Whether you follow the Steiner model of education or not, these Waldorf figures would make perfect tools in any nursery environment. Why are Ostheimer pieces so expensive? We don't think they are! When you consider they are handcrafted, handmade from a socially and environmentally made company in Europe, they are worth every penny. These pieces will last years upon years and can be passed down through families. Just wipe down with a damp cloth and they should be fine. Do not soak your Ostheimer's as they will get destroyed. Ostheimer's natural play makes them perfect Waldorf inspired toys as they are based on encouraging the imagination of your child. Like many wooden toys they encourage slow play. An Ostheimer toy can be used for many different things, in many different settings. All these wonderful open-ended toys and more benefit from fast free delivery when you spend over £40 and a 30 day no quibble returns policy so you can send them back if it's just not love. And if you've fallen in love with the brand as we have but really don't know where to start you can choose an Ostheimer Mystery Box and let the elves and fairies at Babame HQ choose for you.